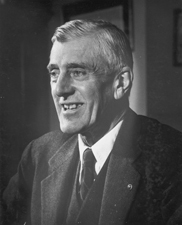 SALTONSTALL, Leverett, (great-grandson of Leverett Saltonstall [1783-1845]), a Senator from Massachusetts; born in Chestnut Hill, Middlesex County, Mass., September 1, 1892; attended the public schools and Noble and Greenough School, Dedham, Mass. ; graduated from Harvard University in 1914 and from its law school in 1917; during the First World War served in the United States Army as a first lieutenant 1917-1919; admitted to the bar in 1919, and commenced practice in Boston, Mass. ; member of the board of aldermen of Newton, Mass., 1920-1922; assistant district attorney of Middlesex County, Mass., 1921-1922; member, State house of representatives 1923-1936, serving as speaker 1929-1936; unsuccessful candidate for lieutenant governor of Massachusetts in 1936; Governor of Massachusetts 1939-1945; chairman of the National Governors Conference 1943-1944; elected as a Republican to the United States Senate, November 7, 1944, to fill the vacancy in the term ending January 3, 1949, caused by the resignation of Henry Cabot Lodge, Jr., but did not assume office until January 4, 1945, after completion of his term as Governor; reelected in 1948, 1954 and 1960 and served from January 4, 1945, to January 3, 1967; was not a candidate for reelection in 1966; Republican whip 1949-1957; chairman, Committee on Armed Services (Eighty-third Congress), Republican Conference (Eighty-fifth through Eighty-ninth Congress); trustee and director of several mutual investment funds and charities; resided in Dover, Mass., where he died June 17, 1979; interment in Harmony Grove Cemetery, Salem, Mass. American National Biography; Saltonstall, Leverett. Salty: Recollections of a Yankee in Politics. Boston: Boston Globe, 1976; U.S. Congress. Tributes to the Honorable Leverett Saltonstall. 89th Cong., 2d sess., 1966. Washington: Government Printing Office, 1966.